Newsletters: February 2001, February 2000. Vineyards: at winery: 2 acres planted in 1986 (Madeleine Sylvaner, Madeleine Angevine, Siegerrebe, Mueller-Thurgau); French Road Farm: 1 acre planted in 1994 (Siegerrebe, Madeleine Angevine, Pinot Noir); Erdeli vineyard: 4 acres planted in 1997 (Siegerrebe, Madeleine Angevine, Madeleine Sylvaner, Pinot Noir) (first crop expected in 2000). Additional grapes purchased: Crawford Vineyards (Prosser) - Lemberger, Cabernet Sauvignon, Merlot, Syrah, Pinot Gris; Kiona Vineyards (Benton City) - Lemberger; Wysling Vineyard (Zillah) - Cabernet Sauvignon, Chardonnay. Distribution: Limited; 60% of production is sold through tasting room; the remainder can be found in stores and restaurants on Whidbey Island and a few stores on the mainland. 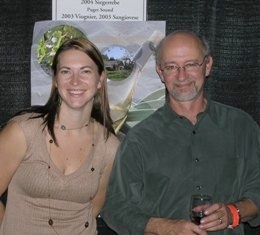 For Greg and Elizabeth Osenbach, an innocent beginning making fruit wines as a hobby soon escalated to more serious efforts with both grapes and fruits and a desire to grow some of their own grapes in the Puget Sound area, then just starting to see it's first modern-day vineyards. At the time the couple lived in the Monroe area northeast of Seattle, where Greg was a partner in a structural steel detailing business. Too close to the rainy west slopes of the Cascades for their comfort, they decided to head for Whidbey Island's sandy soils and sunny skies, buying property near Langley on the south end of the island. They planted 2 acres to Madeleine Angevine, Madeleine Sylvaner, Mueller-Thurgau, and Siegerrebe. Although this vineyard was officially "experimental", the winery building and operating licences soon followed and the first wines were produced from the 1991 vintage. 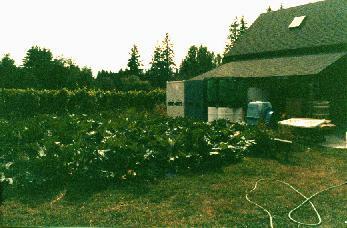 Production increased from 400 cases that year to 2200 cases in 1999 with the addition of new plantings on leased sites on Whidbey and the purchase of red varieties from the Yakima and Columbia valleys. 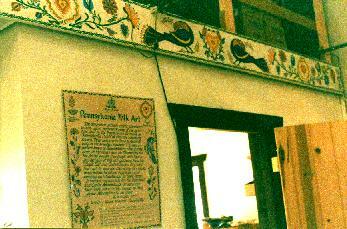 The tasting room was added in 1996. Greg and Elizabeth share the day-to-day winery duties, with Greg doing most of the winemaking and marketing and Elizabeth doing most of the vineyard work and bookkeeping. Grape harvest at Whidbey Island Winery is done by an ever-changing band of volunteers, who are rewarded for a morning's hard work with a hearty lunch accompanied by enough wine to ease aching backs and knees. 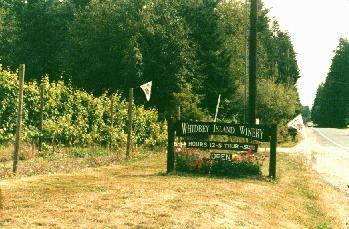 Whidbey Island Vineyard and Winery is part of the new Puget Sound appellation, a designation which was approved by the Bureau of Alcohol, Tobacco, and Firearms in October 1995. Whidbey Island Winery will be releasing a Syrah, a Pinot Gris and a Chardonnay; all from Yakima valley grapes this spring. They have a cozy tasting room and pleasant picnic facilities overlooking the vineyard and the owner's flower and vegetable garden. Greg or Elizabeth are often behind the tasting room counter, and Pinot Noir, the cat, is usually prowling around looking for a handout, or at least a pat. 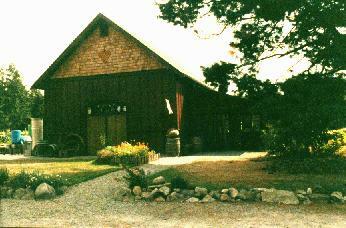 The winery is just outside the scenic town of Langley, which draws many visitors to its galleries and boutiques. 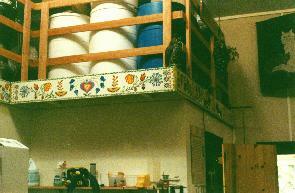 Whidbey Island boasts many fine Bed and Breakfasts as well as great restaurants.